It’s a bit after the events of Princess Academy (six months, maybe? ), and Miri has received a letter from the princess-to-be, Britta. Not only is she inviting all the former princess academy members down to Asland, the capitol city of their country, but she is offering Miri a once-in-a-lifetime chance to go to Queen’s Castle, the foremost school in the country. Of course the girls from Mt. Eskel take the opportunity. And, of course, things aren’t as wonderful in the lowlands as those up in Mt. Eskel have wanted to believe. There’s poverty, there’s corruption, there’s a revolution brewing, and Miri finds herself in the midst of it all. 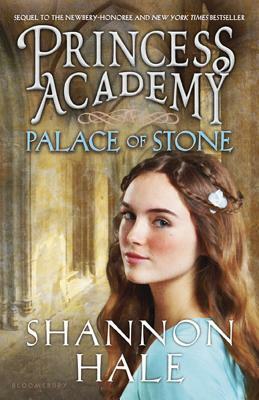 I read this one without picking up Princess Academy first (no time! ), and honestly, it worked for me. Hale is a fabulous story teller, and her worlds are always well-developed and intricate. And she managed to give me enough reminders of the first one sprinkled throughout this book that I remembered what I needed to remember, without being heavy-handed. Hale also explores some interesting ideas: the pull between forces, the choice between two goods, and the inevitable love triangle (the end decision of this one C would love, because she’s always choosing the safe, nice boy, and the girls never end up with the “right” one, in her opinion). There are politics and tough questions, and traitors (though she really didn’t do enough with Gummonth, in my opinion; I wanted him to be more like Grima Wormtongue in Lord of the Rings), and enough conflict to keep me interested through the end. Miri, of course is a strong, quiet heroine, thinking and questioning and trying to do what she feels is right. And even though I felt Princess Academy was quite fine the way it was, I’m glad for this sequel; it allowed me to revisit a world that I remember loving, and reacquaint myself with characters I can’t help but be fond of.